The Defence Security Equipment International (DSEI) arms fair will bring thousands of arms companies to London next week. 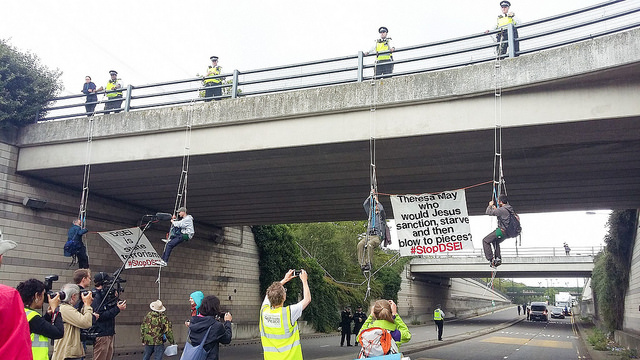 This week can’t have started as DSEI organisers would have wanted it to, with activists from all over the UK travelling to London to stop military equipment from getting into the setup of one of the world’s biggest arms fairs. 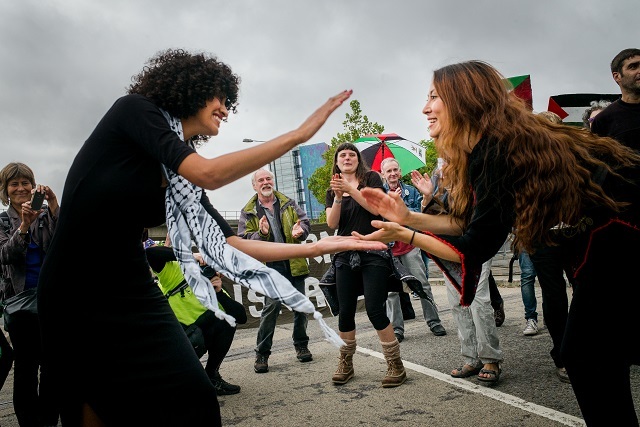 The tailback of vehicles began early in the morning, with Pro-Palestine protesters blocking the road with banners, their bodies and traditional Dabke dancing. The protests went on all day, with mass football matches and a hip-hop concert playing late into the evening. For the organisers it is a sign of things to come. There will be protests and blockades outside the Excel Centre, which is hosting DSEI, every day between now and the start of the event. 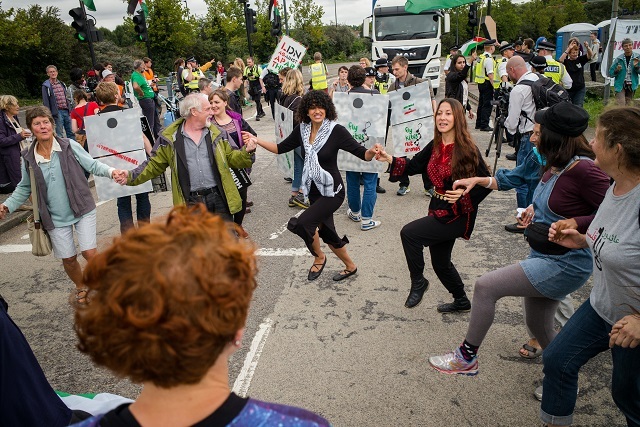 If the roads are blocked and the equipment can’t get in, then how can they host the arms fair? There is no question that public opinion is behind the protesters rather than the arms dealers. Poll after poll has shown a solid opposition to arms exports to human rights abusers – including many of the regimes that will attend DSEI next week. The truth is that the UK arms trade is almost entirely dependent on despots and dictatorships in order to turn a profit. At present, the clear majority of UK arms are going to the Middle East, with by far the largest buyer being Saudi Arabia. The impact of these sales have been devastating. Saudi forces have used UK arms in the brutal bombardment of Yemen. The end result has been one of the worst humanitarian catastrophes anywhere in the world. Thousands of Yemeni people have been killed and millions displaced. Over the last four months, hundreds of thousands of people being diagnosed with life-threatening cholera. The situation is dire, but, despite political and legal pressure, the arms sales have continued unabated. It’s not just Saudi Arabia. The list is yet to be published*, but if previous DSEI guest lists are anything to go by, then DSEI is likely to see representatives from Egypt, Turkey, the United Arab Emirates, Qatar, Israel and other regimes with appalling human rights records. Events like DSEI don’t just offer them military support, they also provide political support. The buyers will be joined by over 1,600 companies, including all of the biggest arms companies in the world, who will be there to promote and sell as many weapons as possible. There will be fighter jet manufacturers, bomb producers, tear gas companies and Israeli companies, like Elbit Systems, which have fuelled and profited from the occupation of Gaza. Events like DSEI couldn’t happen without the full support of government. There is even a 120 strong civil service department, the Defence and Security Ogranisation (DSO), that exists solely to promote arms exports. There is no doubt that DSO staff will be working overtime next week. But they won’t be alone. Five different government ministers will be giving keynote speeches to the arms company reps and buyers, including the Defence Secretary, Michael Fallon, and the Secretary of State for International Trade, Liam Fox. With that level of institutional support, it’s obvious why the arms companies carry such a huge voice in the corridors of power. Unfortunately, as Brexit bites, there is every reason to believe the situation could get even worse. Theresa May and her colleagues are openly calling for an even greater focus on trade and so-called ‘defence agreements’ with the Gulf states. It’s no coincidence that May’s first foreign visit of the year was to see Erdogan in Turkey, a visit which she returned from with a £100 million arms deal in the bag. The message her visit sent to Erdogan and his government was one of uncritical political and military support, but the message it sent to those being tortured and abused in Turkish prisons was that their human rights are less important than profits for BAE Systems. As the arms companies and complicit government ministers push for ever greater sales, we will unite and mobilise as many people as possible against their message of perpetual-war and military escalation. Shutting down events like DSEI is crucial to this. Arms fairs fuel war, conflict and repression. If we are to create a better and safer world then we need to shut DSEI down for good. The UK government has now published its official guest list for Defence & Security Equipment International 2017 (DSEI), following a parliamentary question by Caroline Lucas MP. 56 countries have been invited, these include a range of regimes with appalling human rights records: such as Algeria, Bahrain, Egypt, Kuwait, Oman, Pakistan, Philippines, Qatar, Saudi Arabia, Turkey and United Arab Emirates and Vietnam. Other attendees will be attending with pavilions to do business from, such as Israel, while others will be invited by the event organisers, Clarion Events. Government statistics show that over the last 10 years, almost 60% of UK arms exports have gone to the Middle East.